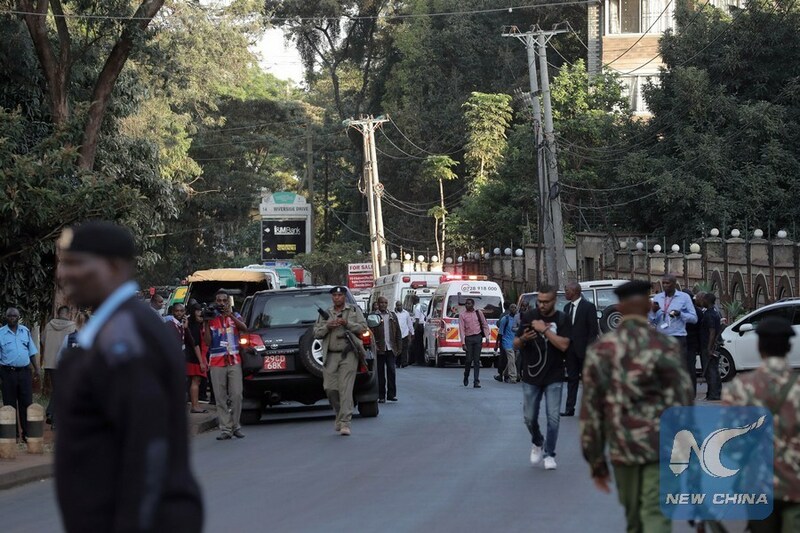 NAIROBI, Jan. 16 (Xinhua) -- Kenyan President Uhuru Kenyatta on Wednesday vowed to reactivate the war against terrorism in the wake of an attack by Somalia-based al-Shabab militants at a business complex in Nairobi that claimed 14 innocent lives. Kenyatta, who spoke at a televised address to the nation, pledged to inject vitality in the country's security infrastructure in order to defeat terrorist networks responsible for killing innocent civilians. "In the coming days, weeks and months, we shall continue the never ending work of strengthening our system. From the means available to the security services, and judicial arms, we will continue taking every step to making our nation inhabitable to terrorist groups and networks," said Kenyatta. Al-Shabab militants on Tuesday stormed the 14 Riverside Drive located in the upmarket Nairobi's Westlands area and held office workers and hotel guests hostage. The siege that lasted about 18 hours ended on Wednesday morning after Kenya's elite security forces neutralized the assailants. A multi-agency security team carried out the operation to flush out the heavily armed attackers while evacuating people trapped at the swanky business complex. Kenyatta, who had earlier convened a national security council meeting, said the government will rededicate efforts to root out terrorism that has remained a grave national security threat. "Throughout the breadth of Kenya and in our immediate neighborhood, multiple security efforts are underway to detect, deter, disrupt and defeat terrorist operatives or groups," said Kenyatta. "We are on the highest alert and shall remain so," he added and urged national leaders and citizens to set aside sectarian differences and rally behind efforts to stamp out terrorism. "Our leaders should speak out strongly, as we pursue the owners, facilitators and sympathizers of these groups knowing that they are an enemy that we will pursue and offer no relief," said Kenyatta. He assured local citizens and foreign nationals that Kenyan security forces were on high alert to ward off terrorist attacks. Somali terror group al-Shabab claimed responsibility for the Tuesday attack, saying they killed 47 people inside DusitD2 Hotel, part of a Thai-owned international chain that appeared to be the chief target of the attackers. The latest came three years after a deadly attack by the militants on Kenya's military base in Somalia's El-Adde town, where dozens of Kenyan soldiers were killed.